The Mountain Goats returned to NYC for the first time since late 2009 for a sold-out run of three shows at Bowery Ballroom. The band is on tour in support of the new album All Eternals Deck (Merge), which was released on Tuesday. Although the Monday show was a celebratory affair and the longest of the three shows, it was also the first night to sell out, so that the crowd contained a large majority of diehards who felt the need to scream out requests for the most obscure songs. But John was in very good spirits and was not rattled by the persistent requests in his banter with the crowd. The setlist was nice mix of older and new material as only five of the thirteen All Eternals Deck songs were played on this night. John played a special request for a friend (“Going to Port Washington”) and acceded to one of the crowd’s obscure calls (“Baboon”), but mostly kept to the written list. The surprise of the evening was the appearance of The Hold Steady lead singer Craig Finn, who shared vocal duties on “This Year” (streaming below). I recorded this set with the Neumanns at the balcony rail pointed at the stacks and mixed with an excellent soundboard feed. The sound quality is superb. Enjoy! All three shows were recorded and will be posted over the next few days. Hey, thanks for this– it was a fun show, & I’m happy to have been there. Can’t wait to listen to this. Just streamed the one song, and John’s “yeah” after the line about the scotch and the tongue is great. Thanks again! Thanks for this fantastic recording. Next best thing to being there. Thanks for this – can’t wait to listen. It was a truly fun night. John is a helluva guy. Thank you sooooo much. I really appreciate you doing all three shows. Please allow me to Spock a few nits to set the record straight. The picture is from the Tuesday show. Also while all the shows sold out and the Monday show was the first, “the first night to sell out” was Tuesday because it was 18+ not 21+. Thank you so much. 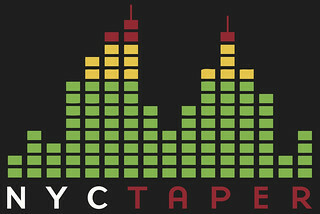 New York and music lovers world wide benefit from your great work. All the photos for these 3 shows will be from Tuesday! That’s the night Maryanne went and she was kind enough to provide 3 photos for these posts (along with Megafaun photos). My memory is that Monday sold out first, but I could be wrong. Happy to be corrected on technical errors. Thanks so much, sounds perfect! Great show!